"Journal writing is a sharing between our true selves and God." It's a powerful yet simple spiritual practice. Journaling goes beyond the nearly constant inner conversations we have with ourselves every day. The mere act of putting our unedited thoughts on paper, in our own handwriting, leads to eye-opening insights, clarity of thought, and deeper reflection. That's why a journal is an integral part of Companions in Christ. Respond to exercises contained in your Participant's Book. Highlight the answers or questions you want to share with others in your group meeting. Reviewing and writing in your journal will be an important part of preparing for each group session. 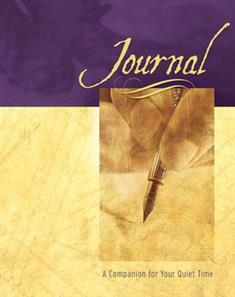 The Companions in Christ Journal complements the entire Companions in Christ series. The 160-page journal features clean, open pages with faint lines to guide your writing. The book's lay-flat binding is flexible and conducive to easy handwriting and yet strong enough to withstand a well-thumbed lifetime. A thoughtful quotation designed to guide your reflection is included in the margin on every other page. An introduction by journaling expert and author Anne Broyles will inspire both the new and experienced journaler. This beautiful journal was designed for participants of Companions in Christ, but anyone can use it. As one of the quotations in this journal says, "Silence becomes like a creative space in which we regain perspective on the whole." Let this journal be a bridge between you and God so that you may be whole!